From Antananarivo, take National Road n°7 to Toliara. 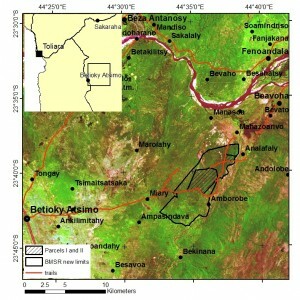 About 70 km before Toliara, in the village of Andranovory, turn left on to National Road n°10 to Amboasary Atsimo. National Road n° 10 passes through Betioky Atsimo (around 65 km, about four hours). The Bezà Mahafaly Special Reserve is located about 35 km northeast of Betioky Atsimo, along an unpaved road. People visiting Bezà for the first time should definitely employ a guide who is familiar with this road, which has many twists and turns. Journey time from Betioky Atsimo to the Field Station is about one hour in the dry season, and is likely to take longer after heavy rain. Air Madagascar has regular flights to Toliara from Antananarivo. Transfer to the Bezà Mahafaly Special Reserve is by car. A four-wheel drive vehicle rented in Toliara will take you directly to the Reserve, via Betioky Atsimo.